Most Americans in the 1730s had limited access to books. Books, in early America, were rare and expensive. There were no public libraries. Only the very wealthy and the clergy had access to large numbers of books. Even men of moderate means could not readily afford books. Enter Benjamin Franklin. On July 1, 1731, Franklin and a group of members from the Junto, a philosophical association, drew up "Articles of Agreement" to form a library. The Junto was interested in a wide range of ideas, from economics to solving social woes to politics to science. But they could not turn to books to increase their knowledge or settle disputes, as between them they owned few tomes. But they recognized that via the Junto's combined purchasing power, books could be made available to all members. So it was that 50 subscribers invested 40 shillings each to start a library. Members also promised to invest 10 shillings more every year to buy additional books and to help maintain the library. They chose as their motto a Latin phrase which roughly translates as "To support the common good is divine." Philip Syng, a silversmith who would one day create the inkstand with which the Declaration and Constitution were signed, designed the Company's seal. In 1732, the Company's first book order was sent to London. James Logan, secretary to William Penn, assisted in picking the books. He was considered "the best Judge of Books in these Parts." In addition to having the largest personal library in Pennsylvania, the learned Logan knew Latin, Greek, and Hebrew. Many of the earliest books in the Library's collection were either religious or educational tomes. But not all. As can be seen from other books donated by the Company's first members, there was an interest in politics, philosophy and business. Benjamin Franklin and others donated a number of works including A Collection of Several Pieces by John Locke and Plutarch's Morals. Franklin also donated his copy of Merchants Mappe of Commerce to the company. The books were kept in the librarian's lodgings. The first librarian was named Louis Timothee. But he soon left the post to become a printer in Charleston, one of the many franchise partners Franklin had in the printing business. He was succeeded briefly by Franklin himself who was in turn was succeeded by a shoemaker named William Parsons. In 1746, Parsons gave way to Robert Greenway. A crucial figure in the early history of the company was Peter Collinson, a learned Londoner, who was also a letter-writing acquaintance of Benjamin Franklin. For many years Collinson was the volunteer purchasing agent for the Company, not only buying the Library's books but making invaluable recommendations. Another important position within the Library was Company Secretary. Secretaries kept meeting minutes, corresponded with Peter Collinson and ordered books from him. The first secretary was Joseph Breintnall. Franklin also served in the position of secretary, though he was not a very organized note taker. After a departure abroad, his meeting notes were found stuffed in a Library Company box which Franklin had left with his wife Deborah. Francis Hopkinson, a future Signer of the Declaration, eventually took over for Franklin and helped organize the Company's records. A stellar cast of characters comprised the early membership of the Company. Beside Franklin, Syng , and Hopkinson, there was Samuel Rhodes, master builder and delegate to the First Continetal Congress. Rhodes was also a member of the Carpenters' Company, the oldest trade guild in America. Rhodes designed Pennsylvania Hospital, American's oldest. Presbyterian schoolmaster Francis Alison was a member as was Dr. Thomas Cadwalader, both names familiar to Philadelphians. In the 1760s, Charles Thomson, who would soon be known as "the Samuel Adams of Philadelphia," became a member, as did John Dickinson, the author of the Olive Branch Treaty. In 1733, Proprietor William Penn donated a print of an "orrery," a device showing the relative position of the bodies in the solar system by means of clockwork, to the Company. The Company hoping to induce Penn to also donate money took a fund-raising trip to the Proprietor's country home. While Penn was not as initially generous as hoped, others, some from abroad, chipped in quite liberally, impressed with the establishment of a library in America. Benjamin Franklin printed the oldest surviving catalogue of the Library Company's holdings which dates to 1741. There were books on history, geography, poetry, exploration, and science. Now, only about 10% of the books were devoted to theology — this in stark contrast to college libraries at the time. And where many university libraries or private book owners read books in Latin, the majority of the Library Company's Books were in English. The library was open Saturday afternoons from 4-8. Members could borrow books freely; non-members could also borrow books — if they put up a surety, something of value that could be sold if the book was not returned. Beginning in the 1740's, several other American cities also began forming their own libraries. Franklin felt that "these Libraries have improved the general Conversation of Americans, made the common Tradesman and Farmers as intelligent as most Gentlemen from other Countries, and perhaps have contributed in some Degree to the Stand so generally made throughout the Colonies in Defence of their Privileges." 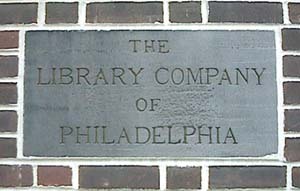 Philadelphia itself spawned new libraries including the Union Library founded in 1746 which had been incorporated from the smaller Association and Amicable Libraries. In 1769, the Union merged with the Library Company. In addition to books, the Company also built up an impressive collection of curiosities and antiques which included: Coins, fossils, geological specimens, flora and fauna, as well as scientific instruments. In 1739, John Penn sent an air pump to the Company and a cabinet was commissioned to hold the pump. Soon the librarian's lodgings were insufficient to hold the Company's collection. In 1739, the group moved into the newly finished rooms on the second floor of the west wing of the State House, the building today known as Independence Hall. Among the most valuable books from the mid-18th century include John Smith's Generall Historie of Virginia and many other accounts of colonization in the New World. Gifts from abroad came in too, including Roman coins from Tory member of Parliament Charles Gray and some Eskimo parkas and tools, artifacts from a Philadelphia-financed exhibition to find the Northwest Passage. Benjamin West, the renowned artist and Swarthmore native sent over a mummified Egyptian Princess from London. Many scientific and electrical instruments made their way to the scientifically interested group. The Companies telescopes and microscopes were frequently used. By 1770, after the merger with the Union Library, the Library Company's catalogue revealed 2,0333 entries. The books were numbered by size — a practice which continues to this day. By 1772, the Library had run out of space, and again started casting about for a new headquarters. They petitioned the Pennsylvania Assembly for permission to build on the State-House Square, but they were turned down. Fortunately, by late 1773 the Carpenters' Company was putting the finishing touches on its headquarters on Chestnut Street and an arrangement was worked out to rent the second-floor space of Carpenters' Hall from the builder's guild. In 1774, while Franklin was in London, he received the following lines: "The Books (inclosed within Wire Lattice) are kept in one large Room and in another handsome Appartment the (scientific) Apparatus is deposited and the Directors meet." The Library Company would soon have some extraordinary company at Carpenters' Hall. On September 5th , 1774, the First Continental Congress met on the ground floor of Carpenters' Hall. Responding to the hardships caused by the Intolerable Acts, this was the first time that all the Colonies, (save for Georgia,) met to determine a unified course of action. John Adams recorded that the site selection committee had a taken "a View of the Room, and of the Chamber where is an excellent Library." As the Library Company knew that Congress would be meeting they ordered that "the Librarian furnish the gentlemen who are to meet in Congress in this City with the use of such Books as they may have occasion for during their sitting, taking a Receipt for them." One member did indeed borrow books, taking out — and returning — Thomas Paine's Common Sense. Congress formally expressed its thanks to the Library Company for its use of the books. When the Second Continental Congress met in Philadelphia in May of 1775, the Library again offered use of its books to the august body. The Second Continental Congress would go on to author its own most remarkable work — the Declaration of Independence. Nine signers of the Declaration of Independence were also members of the Library Company: Benjamin Franklin, Benjamin Rush, George Clymer, Francis Hopkinson, Robert Morris, John Morton, James Wilson, Thomas McKean, and George Ross. In 1787, the Library Company offered delegates to the Constitutional Convention use of the library. Thus, Philadelphia's Library Company was also the first Library of Congress too. In 1789, needing more space and desirous of a building of their own, the Library Company bought a parcel of land near the corner of Philadelphia's Fifth and Chestnut Streets. Dr. William Thornton, an amateur architect won the design competition. His Federal building featured white pilasters and a balustrade surmounted by urns. Leading into the building was a curving double stairway. Over the door, in the second story space, was a niche with a pediment. Fittingly the pediment was filled by a statue of Franklin. 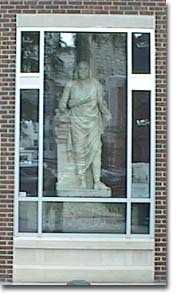 William Bingham, a wealthy merchant donated the elaborate marble piece which was made out of Italian marble by Francesco Lazzarini. The cornerstone of the building was composed by Franklin, who did not live to see the opening of the building on New Year's Day, 1791. Today the Library Company is located at 1314 Locust Street. You can access many of their excellent resources at the Library Company Website.